Moscow was my first stop on The Trail, so it’s fitting that I start with a shot from this city for my new weekly feature, The Reprint. The feature will showcase some of my favorite shots from the journey thus far, giving you a glimpse of life on the road. The sight of a plump tourist snagging a snap of the city’s incredible Cathedral of Christ the Savior brilliantly portrays one of the newest chapters in the city’s history. The fall of the Soviet Union was to tourists, what the January sales are to Yummy Mummy’s. As the curtain came up, the tourists flooded in. Nowadays, they baulk at the prices, poke around the alleyways and generally plod home disappointed and uninspired. If you haven’t guessed, Moscow is my least favorite capital city to date, not least because of it’s overtly rude (read, not endearing) manner. 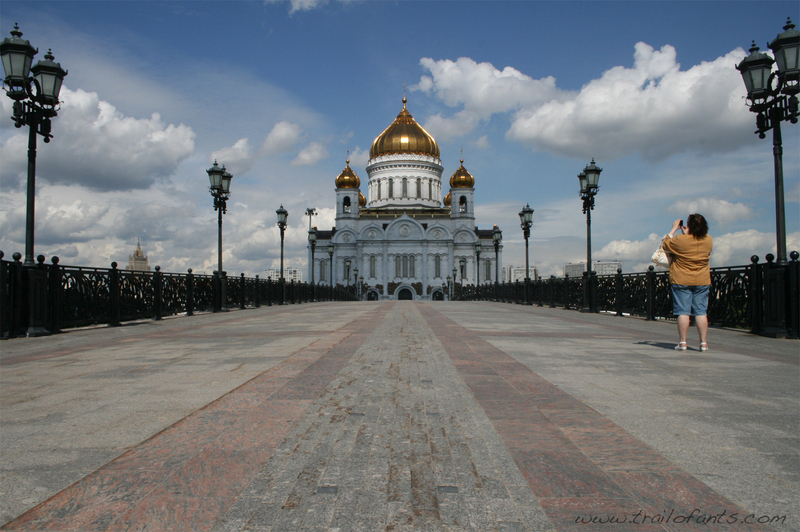 Should you visit Moscow? In my opinion, NYET! But as always, you have to see for yourself; one man’s junk is another man’s gold (it is a seriously drab city though). you are either blind, deaf, stupid, selfish or all of those things. Partially deaf, partially stupid, partially selfish but full-sighted. Thanks Elena.